During a recent visit to my CPAP supplier, they told me that ResMed had made available to them a brand new full face CPAP mask, the Resmed Quattro Air and they wanted to know if I was interested in testing it out. No need to ask me twice! I was quite interested in the Quattro Air because it was billed as being 45% lighter than the rest of the Resmed Quattro range and fewer pieces to take apart and clean. The best way to describe my experience with this mask is just to come right out and say it, I hated it. It was by far the worst CPAP mask I’ve ever tried. During my first night with the Quattro Air, it lasted all of about forty minutes before I had to wake up and put back on my Fisher and Paykel Simplus. I tried it again the second night and it lasted less than half an hour the second time around before I had to get up and switch it out so that I could get some good sleep. So what was wrong with the ResMed Quattro Air? Probably an easier question to answer is, what was right with it? The headgear was nice and soft and it was very easy to adjust in the darkness of night. 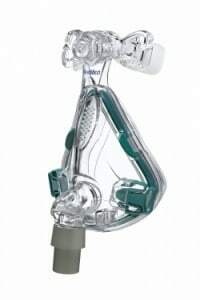 The silicone forehead piece is easily the most comfortable forehead part of any CPAP mask I’ve ever tried – it really is a nice innovation on the part of Resmed. And from there, it really is all down hill. The mask was just way too narrow for my face. When I would open my mouth wide I could feel the corners of my mouth breaking the seal of the mask along the sides. I thought maybe it was just me, but my CPAP provider said when I returned it that this was the same complaint they’ve had from a few people who’ve tested the mask. It was also really uncomfortable on my face. The silicone seal inflated under pressure, but because of how narrow it is, you have to tighten the mask quite a bit and as a result, there’s this harder plastic edging underneath that digs into your face. This was the reason I had to take it off, it actually was a bit painful to wear. The headgear itself is great, like I said, nice and soft, but the way it connects to mask is with hooks that the headgear straps loop over the top of. First of all, it’s not really easy to strap into the mask and secondly, it just feels really cheap. Actually, that was my overarching feeling about the Quattro Air – it just felt really cheap. The lightweight aspect of the mask contributes to that cheap, plastic feel. Which I suppose leads me to the whole “lightweight” angle of the mask… Why? When I first heard about it, I was curious, but then after I thought about it for awhile, it just didn’t seem to make any sense to me why this would be a feature. I’m not going out running great distances in my CPAP mask. Even if I have to take it with me somewhere, the difference in weight is more or less negligible. I really want to put this in context – the fact that over two nights, the mask got just over one hour of combined use is really rare for me. Since starting CPAP therapy four months ago, I’ve had 100% usage – I’ve never once taken my mask off during the night. So for this mask to require me to swap it out, two nights in a row after less than an hour each time was a first for me. There is no scenario imaginable that would ever bring me to recommend this mask to someone else. At the end of the day, the Resmed Quattro Air just seems like a bunch of solutions to problems that nobody is having.